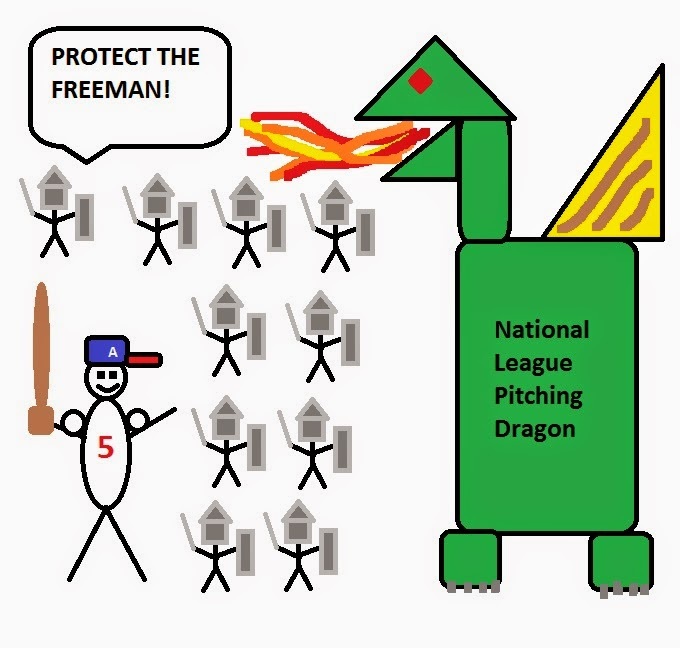 Freddie Freeman will slay the Dragon! Many times you'll hear a baseball person comment about how they need to protect certain hitters, or offer better protection for guys in the lineup. 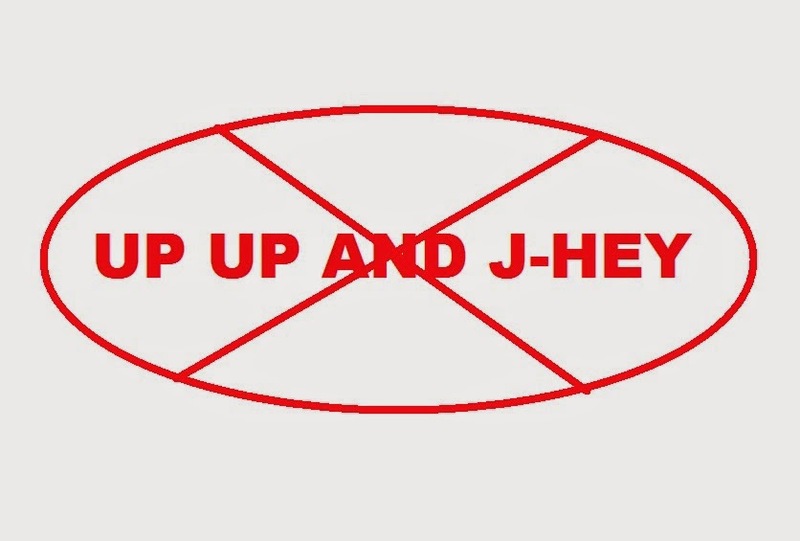 I think that many fans may not understand this concept, or even worse misinterpret what they mean. So what is protection in baseball? Armed guards? Security gates? Condoms and a prayer? Well, maybe all of those off the field, but on the field it's something totally different. For those of you who understand protection in a lineup, feel free to jump ahead if you want. For those of you that don't, here's how it works. On every major league club there is one hitter who is known as a game-wrecker. He's the guy that can change things with one swing of the bat. The long-bomber, the power guy, the home run hitter, the RBI machine. The pitcher would rather clean clubhouse toilets than pitch to this guy with the sacks packed. The idea behind protection is that your power hitter is going to see less quality pitches if the guy behind him is a sub-par hitter. As an example, say I have a guy on second and two outs with Freddie Freeman coming to the plate. Last year, Freddie was slugging .461 with 78 RBIs. Behind him is Justin Upton, a guy slugging .491 with 29 homers. In this scenario I have to make a choice. Do I walk Freeman with a base open and pitch to an even more dangerous power hitter, although he has more strikeouts? Or would I rather just pitch to Freeman even though he's got a better RISP average? In this case, the power of Justin Upton is providing some protection for Freddie. He's likely going to see more pitches and less intentional walks because you'd rather not put an extra runner on base with Justin Upton at the plate. But if it were BJ Upton behind Freddie Freeman? (Just go with me and assume that Fredi G was high when he made out the lineup) I'm absolutely walking Freddie and taking my chances with BJ since he's about as dangerous as two kittens in a fuzzy blanket. In that case, Freddie has no protection and won't see as many good hitting chances in key scenarios. With nobody on base, this obviously matters less, but baseball is all about managing scenarios. Now, if you know me you'll know that I think sabermetrics people like to overplay their hands and start debates that are anti-common sense. There's a lot of things they do that provide value, but they like to be controversial and stick their spreadsheets into things that simply don't belong, then rig the numbers in their favor with weighting of formulas. The simplest things they do are the best, but any time you see adjusted weightings inside largely complicated vast formulas, start asking yourself who is deciding what goes into those formulas and what they are trying to prove. That aside, a sabermatrician would likely tell you protection is meaningless or in their usual parlance "overrated." A traditionalist would tell you protection is invaluable. I fall somewhere in the middle, as I do on most things in the this statistical holy war. I don't think either side from a predictive standpoint is right. I don't think we can be right because you can't fully predict outcomes of baseball games. What I do know is that logically in baseball scenarios I'm going to want to reduce my risk of a game-changing event. And if that means walking or pitching around a batter in a RISP scenario to get to a much lower risk guy, I'm going to do that. What I do know is that Freddie Freeman will be the Braves best hitter going into this season. Freddie has a career OPS of .831, he's got an on-base of .431 in spring so far, and he's already hit two homers. What's interesting is that he's also amassed the second most walks on the team with 8 walks, and that's not a coincidence. Freeman has a great eye, and pitchers don't want to get embarrassed so he'll see fewer give-in pitches. That could continue into the regular season, which is why Freddie will need some protection in the lineup. That protection will likely come in the form of Chris Johnson if he can return to 2013 form, or Jonny Gomes if he can get the big stick going in the right direction. Either way, that's not exactly Justin Upton. The reality is that Fredi Gonzalez is going to have to hope that CJ 2.0 plays really well, or he's going to be constantly shuffling the lineup again to find a hot hand that will play behind Freeman. For a sport where players love consistency, those kinds of changes really mess with production. It's a key thing to watch as the season develops: Who is going to be the consistent clean-up hitter? If the answer is, "We don't know," or "This set of guys," the Braves are in big trouble. All in all, I think that protection for Freeman would be a great thing, because it means that two guys in the middle of the lineup are swinging the bat well. It's hard to argue against that. The Braves play their first real game on April 6th in Florida, and I haven't really allowed myself to get excited until this week. I feel that two weeks away is usually the proper amount of excitement and payoff when the event actually arrives. There's a modifier for football, simply because the heat of summer makes you want stuff more. So the formula goes something like (Anticipation / Days Remaining) x Heat Index = Sports Excitement. Where was I? I get sidetracked by math all the time. Oh right, catchers. We had a ton going into spring training, and even I quipped that when pitchers and catchers reported for early training that would encompass half the squad. Well, we're one less catcher now since John Buck decided to retire today. Buck is my age, so the fact he's retiring from baseball really kicks in my "OLD MAN, YOU'RE OLD!" response. And I'm 33 which really just ticks off all the really old people in my office when I suggest stuff like that. So with Buck gone we're actually down to only two catchers on the active roster. Christian Bethancourt and A.J. Pierzynski. I like both of these guys right of the bat because their names are difficult to spell. I will be referring to Bethancourt sometimes as "C-Beth" and to Pierzynski simply as "AJ" or "our catcher everybody hates." 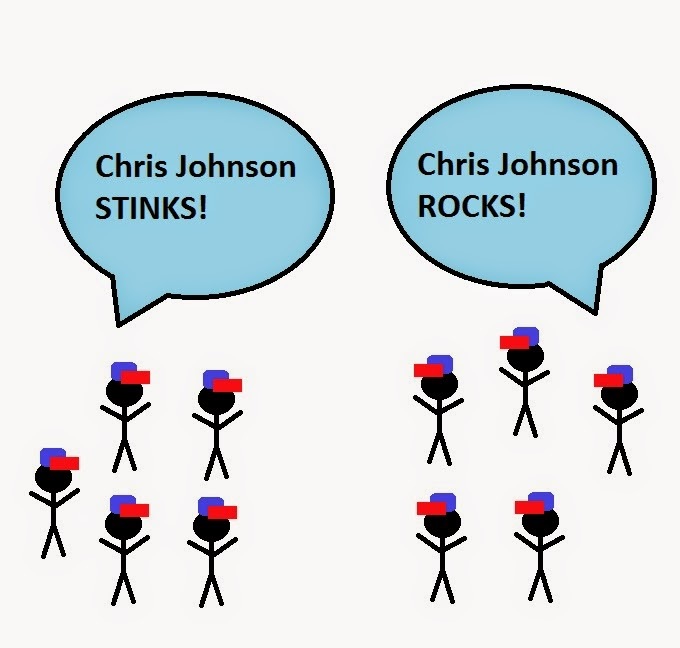 Seriously, ask around about AJ, he's not popular with other teams or his former team for that matter. A microcosm of Pierzynski's approach was mentioned by more than one of the backstop's former teammates, who revealed his propensity to spend a significant amount of time looking at his phone while at his locker during games. In one instance, after a particularly rough outing in which the starting pitcher had been pulled early in the game, Pierzynski could be found staring at his phone while the pitcher gave off the appearance of being an emotional wreck just a few feet away. That incident paved the way for at least one complaint to management from a teammate. Ok so what's my take from that incident? AJ is basically like anybody under the age of 20 that I've ever tried to have a conversation with. Mid-way through making eye contact they'll pick up their phone, answer a text, and make sure their town isn't getting attacked on Clash of Clans. I want to slug people that do that. But that's a crime, and I'm not going back to prison. So while answering your phone and ignoring people is frankly obnoxious, it has absolutely nothing to do with how you play baseball, and it puts you on par with 90% of the populace I see at a restaurant. I mean The Artist Formerly Known As BJ is notorious for being a jerk, but if he was hitting 20+ homers a year and .240 nobody would give a damn. And nobody did for a long time, because that's what BJ was doing in Tampa. Talent lets you get away with being an aloof dude. But you have to back it up with results. So far, AJ is backing it up. Plus he's 37 years old and seen it all at this point. He doesn't have to put up with people's drama-llama nonsense. AJ hit .251 with 12 doubles last year as a catcher. His power has obviously faded, but his ability to put bat on ball and call a good game is not in question. He's going to be the backup, so we need him to be a better version of Gerald Laird, and hopefully as good of a version as David Ross (though I'm not holding my breath there). The starter is going to be C-Beth. Why? Because they've been grooming him seemingly forever, and because we traded away Evan Gattis. If you know anything, and I mean anything, about the minor leagues you've heard Christian's name before. He's been the supposed catcher-in-waiting answer since Brian McCann was still on the team. C-Beth got some MLB spot time last season late in the year where he hit about .250 and didn't really show any power or eye for that matter. He only walked 3 times compared to 26 K's. He looked a little dazzled by the who call-up, which had several fans scratching their heads. What didn't have them worried was his defense. His caught stealing rate was 33%, which is very solid for any catcher in the league. If he can move that to 40% he might be an all-star defender. But the issue that remains with Bethancourt is his bat. The good news is that over the last two years in AA and AAA ball, Christian managed to post OPS numbers over .700, and 10 homers a year on average. In spring this year, he's slugging .600 in 25 ABs. That's obviously too small a sample to really glean much from, other than the fact he's making good contact, seeing the ball well, and he's striking out less. Still, I really want the Braves hitting staff to work on his plate approach. He needs to get those walks up as a guy without a ton of power. The depth chart for catcher looks pretty set now, which about four months ago was completely up in the air. I like both our catchers in terms of being able to do all the defensive things we need. The real test for them this year is, can they hit? I think Fredi will end up playing the hot hand a lot in a platoon, and make adjustments depending on who is swinging the big stick.